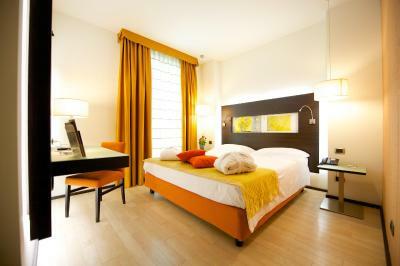 Lock in a great price for Hotel Mercure Siracusa – rated 8.6 by recent guests! 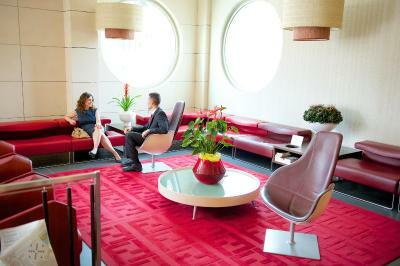 The hotel is new and furnished with all of the latest convenience. The wifi was excellent. For a history buff, the hotel is about a 10 minute walk to the Greek Theater and the later Roman amphitheater. 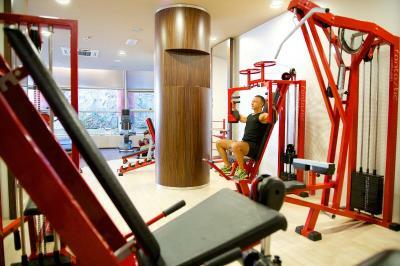 The gym has sufficient facilities for both weight and cardio exercise. The room is nicely decorated. Last, the breakfast quality is not bad. Friendly and helpful and efficient staff who spoke good English. Evening meal was good including local produce (salad, fruit, etc). Room was comfortable and WiFi quick. 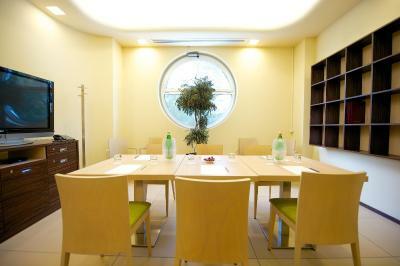 It is located very nice for a business trip and also if the the scope is to visit the city. Very nice staff and ready to support as well as possible. When booking here, you get exactly what you expect from a hotel part of a chain, and even an extra service touch. I was not booking for touristic reasons, and so that was perfect and still, I managed to have an evening stroll to Ortigia. We had some issues with flight delays and we received great help from the staff to organise middle of the night transportation from Catania airport. Thumbs up! This is primarily a business hotel, but we were holidaying and appreciated the expected high standards of accommodation. Don’t expect sea views from rooms but Amazing breakfast. 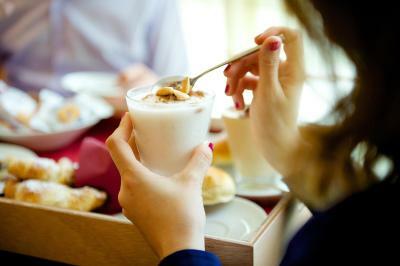 Fabulous choice on food and coffees/teas. Super comfy beds and excellent soundproofing . Rooftop pool was lovely after sightseeing all day. Easy cheap access to Ortigia on a 5euro all day hop on/off bus. We walked & took 25 mins at a leisurely stroll. Greek theatre & archeological park just opposite hotel. Take a left out of entrance & left at traffic lights to find the wonderful pasticceria leonardi. Cakes gelato, arrancini and lunchtime hot food eg lasagne, risotto etc. Clean, inexpensive and lovely staff. Opposite there is a vegetarian restaurant The olive tree. 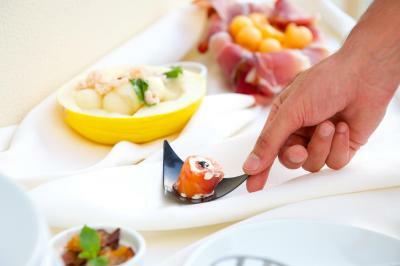 We had a shared platter for mixed starter which was delicious and filling. Prices are middling for Sicily tourist hotspot and food was organic veggies/vegan, very delicious. Big modern rooms that were very clean. Comfortable bed and pillows. Large window that could open. Very nice bathroom facilities. Easy to find good location with free off street parking or paid undercover parking. Very nice rooftop pool. Close to some historic sites .. but about 30 min walk to the old town. Breakfast was excellent. The hotel staff were very helpful.......outstanding. Rooms were comfortable and quiet. Air-con was good. Perfect location, free parking, only 20minute walk to Ortigia Island, the staff were very friendly & helpful on arrival - recommended places to visit, places to eat & beaches to go to. All staff throughout our stay were very friendly and made us feel welcome. The pool was lovely, it's not very big but it has a special jet that allows you to swim on the spot! Breakfast was great, a good selection of fresh fruit, pastries, cereals, and other delicacies. When reception called to request toilet roll & tea/coffee, they were delivered to the room promptly. Other than that, I have nothing bad to say about this hotel. 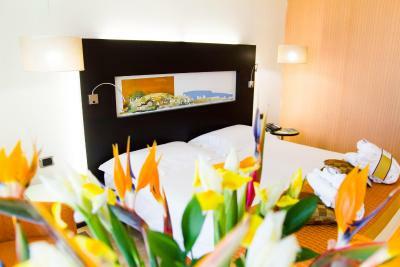 Hotel Mercure Siracusa This rating is a reflection of how the property compares to the industry standard when it comes to price, facilities and services available. It's based on a self-evaluation by the property. Use this rating to help choose your stay! Set right next to Siracusa's archaeological area and Greek Theater, Mercure Siracusa offers a spa, a stunning rooftop pool and restaurant, and minimalist rooms with modern décor. WiFi is free throughout. 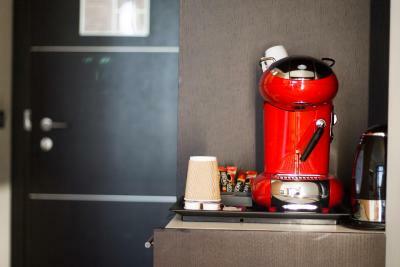 Each room at Hotel Mercure Siracusa comes with air conditioning, a flat-screen TV, and a mini-bar The private bathroom includes a hairdryer and toiletries. The on-site Bar Agorà is open throughout the day for drinks, snacks and lunch. 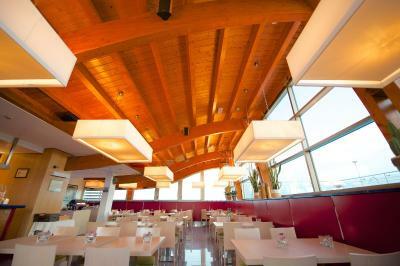 Dionisio Bistrot on the top floor serves fine wines and Mediterranean cuisine for dinner. Guests can unwind at the Syraca wellness center including a sauna, sensory showers and a hydromassage pool. 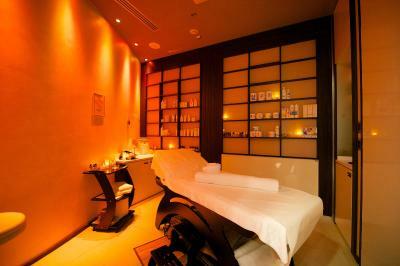 Massages and beauty treatments can also be reserved, and herbal teas are available in the relaxation area. There is a choice of free outdoor parking or garage parking at the Mercure Hotel. The island of Ortygia, Siracusa's historical center, is a 30-minute walk or short drive away. 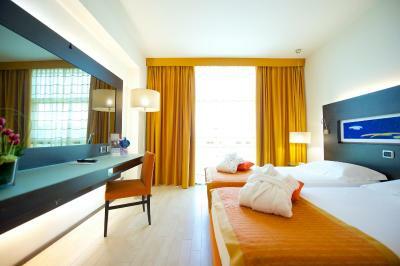 When would you like to stay at Hotel Mercure Siracusa? This air-conditioned room features hardwood floors and modern décor. It includes a flat-screen TV and an extra-large bed, plus a minibar and safe. This air-conditioned room features hardwood floors and modern décor. It includes a flat-screen TV and a small double bed, plus a minibar and safe. 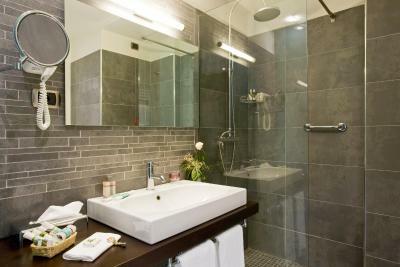 This air-conditioned room features hardwood floors and modern décor. 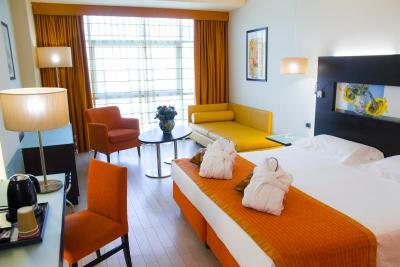 It includes a flat-screen TV and 2 single beds, plus a minibar and safe. Featuring a spa tub complete with soft bathrobes and slippers, this room features an LCD TV and sitting area. 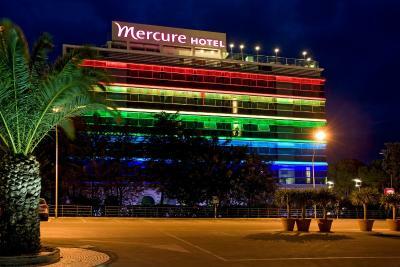 The Mercure Siracusa Prometeo: contemporary architecture in a classic city! 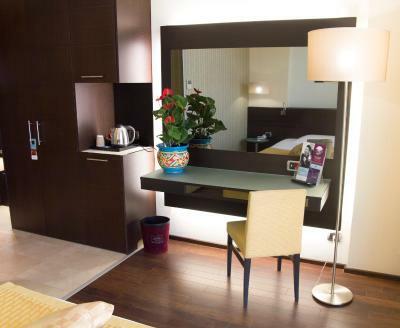 The modern, comfortable Mercure Siracusa Prometeo offers 93 rooms with all the comforts expected in a 4-star hotel. 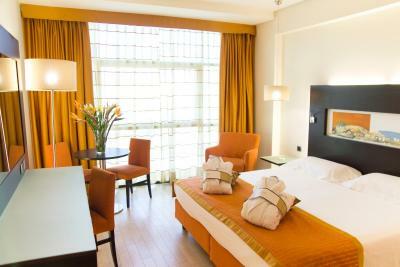 All the rooms have LCD TVs and the Executive Rooms and Suites feature whirlpool baths. The hotel is in the city center, opposite the Archaeological Park and the Greek Theater, and is a few minutes drive from Ortygia Island. 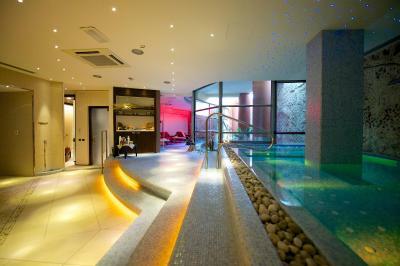 The hotel has a bar/bistro, meeting rooms, pool, solarium, wellness center, car park and garage. 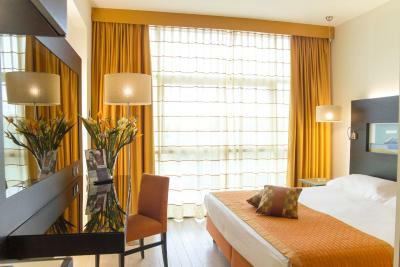 Two Suites can be booked by contacting the hotel directly. 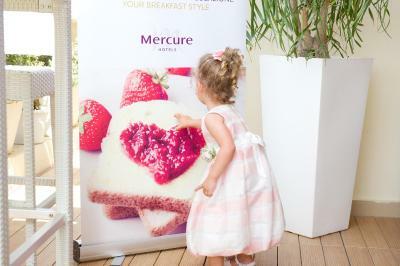 House Rules Hotel Mercure Siracusa takes special requests – add in the next step! Hotel Mercure Siracusa accepts these cards and reserves the right to temporarily hold an amount prior to arrival. 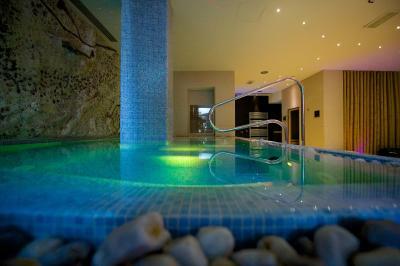 Please note that use of the spa and wellness center comes at an extra cost of EUR 28 per person. Massages are available at an extra cost. If the name on the credit card used for the booking does not correspond to the guest staying at the property, a third-party authorization by the cardholder must be submitted at the property. Please inform Hotel Mercure Siracusa of your expected arrival time in advance. You can use the Special Requests box when booking, or contact the property directly using the contact details in your confirmation. It was just a very short trip so i can not tell to much about this. Given that Sicily is a land of great food, the breakfast was not up to standard in our opinion. There was enough choice, but overall quite bland. Maybe a bit less choice and better quality cheese & ham would be an improvement. Location is a bit out of town but we knew that , and we didn’t mind the walk into town. Nothing to complain about the hotel. Location not central and not really equipped for holidaymakers staying a full week. Good for business travellers or 2 to 3 day leisure stops. Poor facilities for relaxing in communal areas if weather poor. Unless prepared to pay 20 Euro for a few hours in the spar facility. Limited catering. Over priced and underwhelmed by the standard of service. We expected more from a Mercure hotel. Aircon did not work in the room. Paper cups for tea/coffee. Use of a pool towel costs 3 euro. Breakfast okay - but nothing special. Limited range of restaurants/shops close to the hotel. Restaurant food, lunch, was poor (had the worst spagetti bolognese since junior school dinners. Television in the room had many, many channels....but few in English.......and CNN can easily drive you crazy. Our tea & coffee in the room wasn't always replenished, and neither was our toilet roll but this was replenished promptly when requested. It was a little bit far to visit Ortigia as the buses had been suspended. However, excellent location for the Museum and Greek theatre etc. Great room, very good bed and excellent rooftop pool. Breakfast was exceptionally good. The staff we're very friendly and helpful and arranged a transfer from Catania airport to the hotel at the start of our visit.